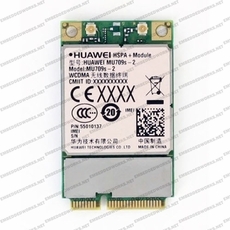 MU709 family is high-quality designed HSPA+ module in small size and Huawei standard LGA form factor which specially for industrial-grade M2M applications such as vehicle telematics, tracking, mobile payment, industrial router, safety monitor and industrial PDAs.Based on Huawei standard LGA technology, the M709 modules provide a smoothly path to Huawei LTE high-speed modules.MU709 family supports 21.6Mbps downlink data rate, providing data and voice service under global GSM/GPRS/EDGE/WCDMA/HSDPA/HSUPA/HSPA+ networks. 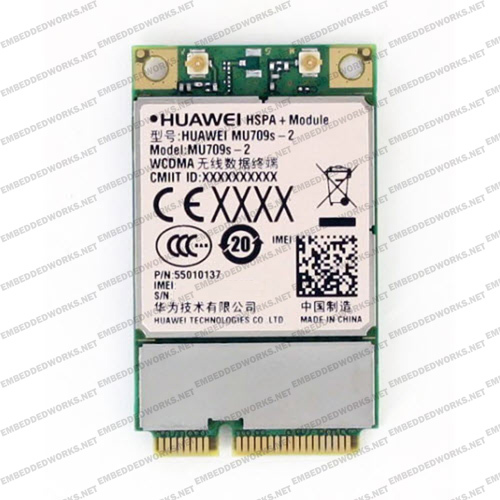 The module also include enhanced features like embedded TCP/IP stack, SMTP, FOTA, Jamming Detection, Netscan, CMUX, SSL, eCall, Huawei enhanced AT commands, cell lock, network monitoring, DTMF decoder, baud rate adaptation, multi PDP, SIM swap, .etc.With Huawei standard LGA form factor, it is easy to migration from MU509 family, MC509 and MU609 to MU709 family and the LTE module ME909. MU709s-2 (UMTS/HSPA+ 900/2100MHz), for European, China market. MU709s-6 (UMTS/HSPA+ 850/1900/2100 MHz), for Asia pacific, Latin America market. Both are also available in Mini-card format as well. All Huawei modules comply with the RoHS directive and Regional certification.